Time is our most valuable asset. No matter how hard you work or how much money you make, you will never be able to earn more of it. The only option we have is to maximize the little bit we have been granted. We each go about this in separate ways. We chase careers, love, adventure and dreams. There is no right or wrong answer to how you chose to spend it. The only mistake we can make is letting it pass by. Time is all we really have and each day a little more runs out. My mom’s side of the family is Italian and its greatest influence on me starts and stops at the dinner table. My grandma is a great cook and so is my mom. Some of their best dishes are Italian classics; pasta and meatballs is at the top of the list. As a kid I would always do my homework in the kitchen and most nights mom was cooking. On the occasions that she made meatballs I would pay extra attention to try and uncover what made them so good. And I knew she wasn’t a fan of touching the meat so if I were willing to get my hands dirty I’d be employed to mix them up. It was like a science experiment, meat squishing between your fingers as she added the ingredients one at a time. Breadcrumbs, Parmesan cheese, salt, pepper, garlic, a little of this, a little of that and then she always cracked an egg or two in there as well. The egg was always cold and made the mixture extra sloppy as the yolk ran through my hands. Kids today have dietary restrictions worse than a yoga instructor in Santa Monica. But when I was a kid and the meatballs were finally mixed up, mom would ask, “how are they?” This was my chance to snag a little piece of raw meat and let her know if they needed anything extra. Probably sounds like a stomachache to most but to me it was the filet mignon of meals. That little bit of raw meatball was a little slice of heaven! Tonight I made meatballs for the first time. I’m not sure what inspired it but I had some ground Turkey in the fridge and decided to go for it. My Grandpa was probably looking down and asking if I had turned into a yoga instructor myself, considering they weren’t made with red meat. Anyway, I got a bowl and got to work, turkey, breadcrumbs, Parmesan cheese, salt, pepper, a little of this, a little of that and a cold egg cracked right on top. Mixing them up brought me back to being a kid in the kitchen only this time I skipped eating the raw meat. Maybe I’m getting older or wiser but something about raw turkey didn’t seem as appealing. It turns out, even without the taste tester, I make a damn good meatball. As a kid, reading always seemed like a chore. My time seemed better spent making up games in the neighborhood or exploring the mighty depths of my backyard swimming pool. It wasn’t until college that I really began to enjoy reading. Maybe it was because no one was telling me what to read but something tells me it had more to do with the constant snowfall I was experiencing for the first time in Boston. I started reading about entrepreneurs and their path to success. I was instantly hooked and still am today. Leaving Microsoft, Start Something That Matters, and What I Wish I knew When I Was Twenty are a few that stand out from that time. They probably weren’t written with any grammatical prowess but to me they were inspiring stories about people whose careers and lessons seemed to resonate. I still love these stories and others like it but recently have dabbled in alternative formats. Today I completed The Rule of Four by Ian Caldwell and Dustin Thomason. I’m not going to write a book report, as that might have had something to do with my aversion for reading as a kid. But I will say that I was impressed with its structure. The story was told in an elegant manner and the characters developed naturally throughout the novel. The authors had this almost uncanny ability to reintroduce each one right as you were wondering where they might be or what they might add to the conversation. The present is simply a reflection of the future. Imagine that we spend our whole lives staring into a mirror with the future at our backs, seeing it only in the reflection of what is here and now. Some of us would begin to believe that we could see tomorrow better by turning around to look at it directly. But those who did, without even realizing it, would’ve lost the key to the perspective they once had. For the one thing they would never be able to see in it is themselves. By turning their backs on the mirror, they would become the one element in the future their eyes could never find. The future is exciting; it is the master of the unknown. With it will come new beginnings and new ends. It poses new challenges and answers some very tough questions. The entrepreneur books I have read make me hopeful for the future. They make me feel like anything is possible, the world is ours to make the imprint we wish to leave behind. However, our decisions and actions today are the greatest determinant for what is to come. Be present and focus on what you can do today to build the future of your dreams. And most importantly, never turn your back on the present to search for a better tomorrow because you just might get left behind. Above my desk there is a hand written note that reads, “An idea without execution is nothing more than a hallucination”, a simple reminder from a trusted mentor that ultimately led me to my first Startup Weekend in Los Angeles. Coming to Start-up Weekend I had little expectations and figured that even if my idea didn’t get picked as a finalist I would meet some like-minded entrepreneurs and have some fun grinding out a business model over the course of 3 days. Over 45 ideas were pitched and when the voting had concluded on the opening night, HORSE had been selected as a finalist; it was time to get to work! I quickly amassed a team; an advertising executive, a professor, a social media marketer, one designer, and two developers. Not only did each member bring a unique set of qualifications to the team, but also they were energetic and excited about the idea! We knew the competition was going to be tough as the talent pool at Startup Weekend was impressive. Regardless, we were determined to win. Other teams were after the same goal, and over the course of the weekend this passionate group of entrepreneurs became a community of supporters; each of us taking time to sit with opposing teams and offer thoughts and suggestions for how we might improve each other’s products and businesses. It was so energizing to see a room of what started as complete strangers morph into this powerful group of people executing great ideas. After a sleepless weekend, we had developed an MVP, constructed a customer acquisition strategy, conducted market research, outlined a revenue model and ultimately crafted a pitch designed to stand out from our competition. Once the pitches had concluded and the judges made their final decision, HORSE had won the race! It was a job well done and one hell of a weekend! o Your ideas will forever be hallucinations unless you share them. Don’t be afraid that someone will steal it! o Everyone is there to learn and support one another, don’t be nervous about getting up in front of the crowd. But just in case you’re like me and still get a little shaky….don’t worry they have free beer! o There are lots of talented people that attend but finding a team that is really passionate about your idea or joining an idea you are passionate about makes the weekend a lot more fun! o Be sure to spend time talking to other teams and networking with everyone at the event, your own team and idea are only part of the reason you attend Startup Weekend. o Win or lose, this can be a great weekend to network with a potential employer, co-founder or new found friend. If you’re reading this article you are already ambitious and determined to succeed…don’t forget to take a minute to enjoy the ride along the way! Thank you to Coloft and Startup Weekend LA for an incredible opportunity and experience. Visit www.horsetheapp.com to download now! I was born and raised in Florida. Some of the best days of my life have been spent fishing with my best friends. This is a story about one of those days. I’d fished the Everglades before. A seemingly endless expanse of swamp and water, the Everglades make for some of the best fishing in Florida. On this particular trip, three friends and I decided to go out for tarpon. 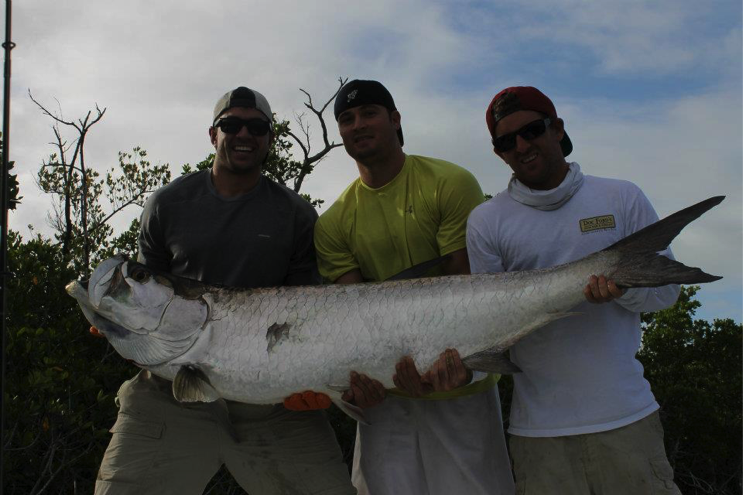 For those of you who don’t know, tarpon are big, strong sport fish. Getting to them in the glades can be a hike and certainly not guaranteed. We decided to try our luck on a remote stretch of the Everglades. In the three days we were out, we didn’t see another soul. We rode in Friday, set up camp, and started fishing. We spent all of Saturday fishing. Between the four of us, we jumped 12 tarpon and ended up getting four in the boat. Sunday started off even better than Saturday. It only took us three hours to jump 10 and land three more. It was around 10am that John hooked the biggest fish of the trip. A 100lb beauty, John got it right in the corner of its mouth. After a few jumps and one hell of a fight, we finally had the fish alongside the boat and I volunteered to take the hook out. You’re right, I am a dumbass. As I said before, tarpon are big, strong fish. After a quick breather, Big Bertha decides the fight is still on and starts thrashing her head. The only problem was that my hands were still in her mouth. Then in a flash, Bertha had somehow escaped the hooks and was on her way to terrorizing the next group of anglers brave enough to cast in her direction. As I watched her swim away, I came to the painful realization that the hooks (as in, more than one) had found their way into my fingers (as in, more than one). Lovely. Since we forgot wire cutters, it looked like my day was over. My fingers were stuck together worse than that one time I super glued them together in 5th grade while making a science fair project. Suddenly, the remoteness that attracted us to the fishing spot in the first place became an issue. Being hours away from the nearest group of anglers means you’re also hours away from the nearest hospital. Since it would have been a long trip in anyway, I decided the group should continue fishing. I then came to the unfortunate realization that, in addition to forgetting the wire cutters, we also forgot any painkillers. At least we had beer. While the guys continued to catch fish (justifying my sacrifice), I drank. When the fishing slowed down the guys decided it was time to get me to a hospital. After a 2 hour boat ride and almost 2 hours in the car we finally arrived at the hospital. 1 tetanus shot, 2 numbing shots, and an hour later I am on my way home. Fingers finally free after 11 hours!